Pemba is the second largest island in the Zanzibar archipelago, which lies in the Indian Ocean just off mainland Tanzania in East Africa. There are three large islands in the archipelago, and many smaller ones. The largest and best known island is called Zanzibar by most of the world, but its local name is Unguja. It's about 25 miles directly across the channel from Dar es Salaam, the Tanzanian capital on the mainland. Stone Town, the ancient Arab trading city at the heart of Zanzibar City and a World Heritage site, is the center of Unguja's thriving tourism industry. To the south of Unguja is the smaller Mafia island, and to the north is Pemba. Approaching the island of Pemba from the Tanzania mainland. Pemba is divided into about 85 Shehias, each made up of 3-5 small villages under a common leader, or Sheha. There are 3 towns: Chake Chake, Pemba's administrative capital; Wete, in the north, is the largest town on the island; and Mkoani, in the south, is the main port. The island of Pemba is about 40 miles long and 15 wide. The islands, ruled by the Revolutionary Government of Zanzibar, are a semi-autonomous region of the Republic of Tanzania. The political history is complex. The Republic was created in 1964 from the union of Tanganyika and Zanzibar, after independence from Britain, although Zanzibar came to this union via a bloody revolution against its Sultan, who was a holdover from Omani rule which dated back to the 17th century. The Tanzanian union has had something of a rocky existence since, as has internal Zanzibar politics. Competition between opposition parties and the party that has ruled Tanzania and Zanzibar continuously since independence — the party of Julius Nyerere: first president and "Father of the Nation" — is a recurring theme in Tanzanian politics. Zanzibar holds elections both for its own parliament, and for the Tanzania parliament on the mainland. Zanzibar has experienced election irregularities and some violence, and Pemba, as the home of the main Zanzibar opposition party, has seen some of the worst, particularly after the 2000 and 2005 elections. In 2010 a referendum approved the formation of a unity government in Zanzibar, combining the ruling and opposition parties. The move successfully brought political peace. But then to the great frustration of opposition voters, and over the objections of international observers, in the 2015 elections the ruling party was able to maneuver itself back into power. However, regardless of politics the vital need for sustainable development remains, and is the focus of the Pemba Foundation. People in the Zanzibar islands are of Arab, Indian, Persian and African descent, and the culture is a unique and rich mixture of all those influences, with a little Portuguese and British thrown in. Almost everybody is Muslim; the larger towns each have several mosques, and even the smallest village has its own Imam and mosque, often a simple one-room building. The main language is Kiswahili, but in Pemba particularly a number of local dialects are spoken which may not be understood by Kiswahili speakers. Find more detailed descriptions of Tanzania history and politics via the US State Department's country page here. Wikipedia has a well-researched history of Zanzibar and its revolution here. Collectively these islands have been known as the Spice Islands, and they were once the world's largest producer of cloves. While that's given way to tourism as the main industry on Unguja, on Pemba spices – mainly cloves but also pepper, cinnamon and others – are still grown in large quantities and are a key source of income. It's said there are three million clove trees on the island. Other important cash sources are seaweed aquaculture and remittances from abroad. Flower buds of the clove tree. When dried they take on the familiar dark brown appearance. Pemba is lush, hilly and fertile, with pristine beaches and magnificent coral reefs (proposed for World Heritage status). But it's densely crowded, with about 500,000 people in 380 square miles. That's as dense as Western Europe, with its large industrial cities. 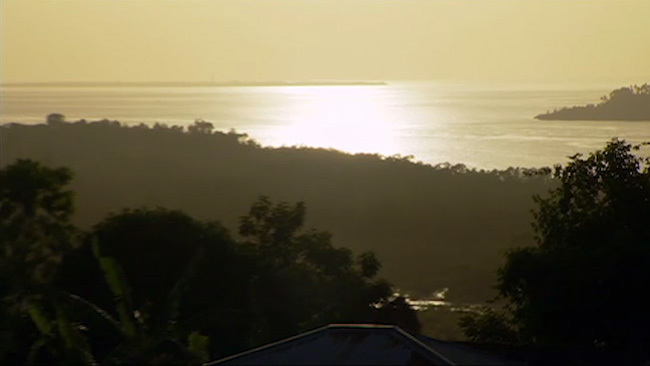 Pemba has three small towns and practically no industry. Tourism is limited to a few hotels catering mainly to scuba divers, and subsistence farming and fishing are vital for most peoples' survival. Many families will farm an acre or two, growing rice, coconut, bananas, cassava, beans, while about a third of the population depends on small scale fishing on the reefs and in the lagoons. 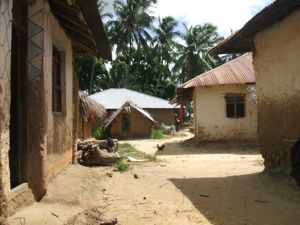 Typical Pemba villages. 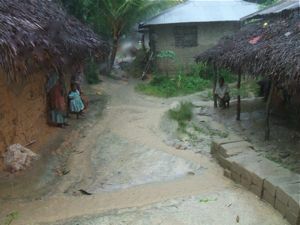 During the "long rains" (April-June), conditions get especially difficult. 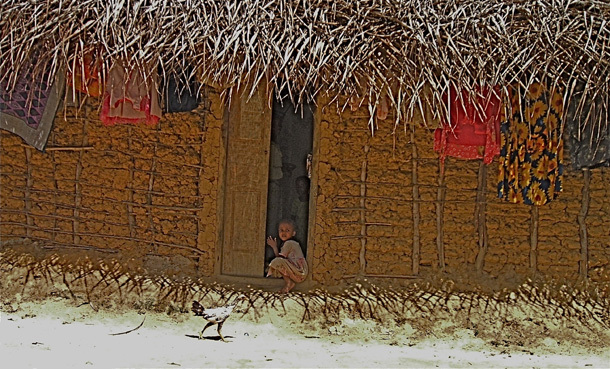 In spite of idyllic appearances, most Pembans are poor, living mainly in a large number of rural and coastal villages. Tanzania is one of the poorest countries in the world; the Republic of Zanzibar is poorer than the mainland; and within Zanzibar, people in Pemba are on average poorer than those in Unguja. More than half the Zanzibar population lives below the UN poverty line (less than $1 per day); life expectancy is about 48 years, about 60% of what it is in Western countries; and other common measures of poverty, like infant mortality, maternal health, literacy rates, nutrition and so on, follow a similar pattern. The Zanzibar government's current Strategy for Growth and Reduction of Poverty, known as MKUZA II, has a detailed and realistic analysis of the development challenges facing Unguja and Pemba.